For the California wine region, see San Benito AVA. El Camino Real passes through the county and includes one mission in San Juan Bautista. According to the U.S. Census Bureau, the county has a total area of 1,390 square miles (3,600 km2), of which 1,389 square miles (3,600 km2) is land and 1.8 square miles (4.7 km2) (0.1%) is water. 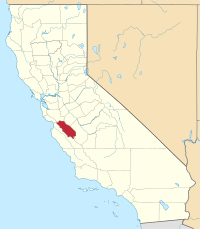 Sharing a border with Santa Clara County, San Benito County lies adjacent to the San Francisco Bay Area and is sometimes considered a part of that region. Frequently, the county is associated with the Monterey Bay Area through governmental organizations such as the Association of Monterey Bay Area Governments as well as the Pajaro River, which flows from northern San Benito County into the Monterey Bay. However, the United States Census Bureau includes the county in the San Jose-Sunnyvale-Santa Clara MSA and the San Jose-San Francisco-Oakland CSA, which the Census uses as a statistical definition of the San Francisco Bay Area. The county also borders Merced County and Fresno County in the east, which lead onto California's San Joaquin Valley. The county is also the location of the Mount Harlan and San Benito American Viticultural Areas. The latter contains the Cienega Valley, Lime Kiln Valley, and Paicines AVAs. There are a number of plant communities that occur in San Benito County including grasslands and chaparral; however, one of the more unusual is the Sargent cypress forest. Benitoite, the official gem of the State of California, was discovered in San Benito County. The county is also home to the San Benito evening primrose (Camissonia benitensis); and Illacme plenipes, a millipede having more legs than any other millipede species, discovered in the county in 1926. The plant genus Benitoa was named for San Benito County. The 2010 United States Census reported that San Benito County had a population of 55,269. The racial makeup of San Benito County was 35,181 (63.7%) White, 483 (0.9%) African American, 895 (1.6%) Native American, 1,443 (2.6%) Asian, 94 (0.2%) Pacific Islander, 14,471 (26.2%) from other races, and 2,702 (4.9%) from two or more races. Hispanic or Latino of any race were 31,186 persons (56.4%). As of the census of 2000, there were 53,234 people, 15,885 households, and 12,898 families residing in the county. The population density was 38 people per square mile (15/km²). There were 16,499 housing units at an average density of 12 per square mile (5/km²). The racial makeup of the county in 2010 was 38.3% non-Hispanic White, 0.6% non-Hispanic Black or African American, 0.4% Native American, 2.3% Asian, 0.1% Pacific Islander, 0.1% from other races, and 1.7% from two or more races. 56.4% of the population were Hispanic or Latino of any race. 7.6% were of German, 6.3% Irish and 5.4% Italian ancestry according to Census 2000. 62.8% spoke English and 35.3% Spanish as their first language. As of the 2010 United States Census, San Benito County was the only county in the greater San Francisco Bay Area with a Hispanic majority and where a minority race formed the largest race composition. There were 15,885 households out of which 46.3% had children under the age of 18 living with them, 65.7% were married couples living together, 10.5% had a female householder with no husband present, and 18.8% were non-families. 14.1% of all households were made up of individuals and 5.4% had someone living alone who was 65 years of age or older. The average household size was 3.32 and the average family size was 3.64. In the county, the population was spread out with 32.2% under the age of 18, 8.8% from 18 to 24, 31.5% from 25 to 44, 19.3% from 45 to 64, and 8.1% who were 65 years of age or older. The median age was 31 years. For every 100 females there were 102.5 males. For every 100 females age 18 and over, there were 99.6 males. The median income for a household in the county was $57,469, and the median income for a family was $60,665. Males had a median income of $44,158 versus $29,524 for females. The per capita income for the county was $20,932. About 6.7% of families and 10.0% of the population were below the poverty line, including 11.4% of those under age 18 and 8.5% of those age 65 or over. San Benito County has the last elected Marshal in California. Shasta and Trinity Counties still have appointed Marshals. In the United States House of Representatives, San Benito County is part of California's 20th congressional district, represented by Democrat Jimmy Panetta. In the California State Legislature, San Benito County is in the 12th Senate District, represented by Democrat Anna Caballero, and in the 30th Assembly District, represented by Democrat Robert Rivas. San Benito is a Democratic-leaning county in Presidential and congressional elections. The last Republican to win a majority in the county was George H.W. Bush in 1988. San Benito is also considered a bellwether county for California in presidential elections; since 1904 the solitary candidate to carry the state without winning this county has been Harry S. Truman in 1948. Before 1904, however, it was a solidly Democratic county whilst the state leaned Republican, voting Democratic in every election from its creation in 1876 up to and including 1900, although California only voted Democratic in 1880 and 1892. As of May, 2010, the California Secretary of State reports that San Benito County has 34,562 eligible voters. Of those 24,736 (71.57%) are registered voters. Of those, 11,959 (48.35%) are registered Democratic, 7,477 (30.23%) are registered Republican, 565 (2.28%)are registered American Independent, and 116 (0.47%) are Green Party. The two incorporated municipalities of Hollister and San Juan Bautista have Democratic majorities on their voter rolls, whereas the unincorporated areas of San Benito County have a small Republican plurality in voter registration. The economy is statistically included in metro San Jose, though the dominant activity is agriculture. Agritourism is growing as the county has destination wineries, organic farms and quaint inns with views of cattle grazing. With concerns about how oil and gas operations could impact this sector of the economy and agriculture in general, the county voters approved a measure in 2014 that bans well stimulation techniques such as fracking, acidizing and steam injection, along with conventional drilling in some areas. In the 1950s, the oil drilling industry had many wells and the county is over the Monterey Shale formation but there is very little activity now. The principal newspaper of San Benito County is the Hollister Free Lance, founded in 1873 and published weekly on Thursdays. The county is served by regional broadcast media, including KSBW television, and the Community Media Access Partnership (CMAP) nonprofit community media initiative. KQKE, at 97.5 FM, "The Quake" San Benito County Community Radio provides a low power signal. KXSM, at 93.1 FM, broadcasts a regional Mexican format. K206BQ, at 89.1 FM, rebroadcasts KLVM. K265DG, at 100.9 FM, rebroadcasts KPRC-FM. San Benito County Express provides fixed route service in the city of Hollister, and intercity service in the northern portion of the county. Service operates as far north as Gilroy, in Santa Clara County. Hollister Municipal Airport is a general aviation airport located just north of Hollister. The population ranking of the following table is based on the 2010 census of San Benito County. ^ "San Benito Mountain". Peakbagger.com. Retrieved April 11, 2015. ^ a b c "State & County QuickFacts". United States Census Bureau. Retrieved March 24, 2017. ^ Louderback, George Davis. 1907. "Benitoite, A New California Gem Mineral." Bulletin of the Department of Geology, Vol. 5, No. 9. University of California Publications. ^ Hickman, James C. (editor). 1993. The Jepson Manual: Higher Plants of California. University of California Press. ^ Sara Goudarzi (June 7, 2006). "666-Legged Creature Rediscovered". LiveScience. ^ "California's 20th Congressional District - Representatives & District Map". Civic Impulse, LLC. Retrieved September 24, 2014. ^ Leip, David. "Dave Leip's Atlas of U.S. Presidential Elections". uselectionatlas.org. Retrieved September 1, 2018. ^ Cart, Julie (November 29, 2014). "Election win puts rural San Benito County on anti-fracking map". Los Angeles Times. ^ "San Benito County Chamber of Commerce-Economic Development". sanbenitocountychamber.com. ^ Color Spot Buys El Modeno Assets. Greenhouse Grower. ^ CNMP, US Census Bureau,. "This site has been redesigned and relocated. - U.S. Census Bureau". www.census.gov. 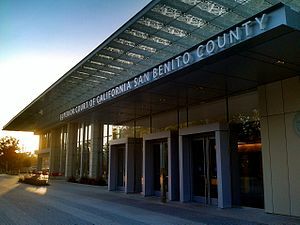 Wikimedia Commons has media related to San Benito County, California. Wikisource has the text of the 1879 American Cyclopædia article San Benito.